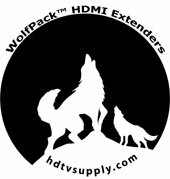 HDTV Supply's WolfPack™ HDMI Over IP Extender sends an HDMI 1.3 Signal 400' to one or more TV's using one CAT5/6/7 cable over a managed Ethernet network. It also returns an IR control signal to the source to control it. The HDMI extender applies H.264 technology to transmit a lossless HDMI signal from the source up to 400 feet to your HD display over single CAT5/5e/6 cable. Our HDMI Over IP Extender supports the highest resolutions up to 1080p@60Hz. The HDMI Over IP Extender connects via an Ethernet switch to distribute & Extend an HDMI signal with the lowest bandwidth consumption (10Mbps/RX) so to minimize picture quality. It is controlled by a Web GUI Browser. The WolfPack HDMI Over IP Extender uses H.264 technology to provide high-definition & most vivid output image quality. This HDMI Over IP Extender includes a SEND and a RECEIVE unit plus AC adapters. One converts HDMI to the LAN and the another converts the LAN back to HDMI. The units also come with one set of IR send and receive control cables. The supplied remote control allows you to choose the source and the LED shows the group ID. Multiple receivers can simultaneously connect to many transmitters to form a WolfPack virtual matrix of up to 64 HDMI inputs with up to 253 HDMI receivers (widescreens). Low bandwidth occupation - 10Mbps. Good anti-interference performance, strong adaptive ability for long time operating and use in high temperature. Simple to install i.e. plug and play. Embedded infra-red (IR) control path allows user to control HDMI sources remotely from the displays up to 400 feet away. Universal power supplies at 100 to 240 VAC, 50/60 HZ to 5VDC, 2 prong. Each device is installed using 1 twisted pair cable. AV signals are transmitted digitally over the solid CAT5/6/7 cable without any signal loss. Internal JPEG video compression adapts to the available network bandwidth if needed. The integrated Scaler function allows different input and output resolutions (different displays can be at different resolutions). The IR TX / RX function can be used remotely to control the HDMI source device from any receiver location. The 2 cables are included that support it. NOTE: This HDMI Over IP Extender Set w/Remote IR is not an HDMI Balun, but an HDMI over IP system. This means you can create your own A/V Ethernet network and all of the receivers will find the transmitter automatically. It may even be used over smaller existing house networks and low cost LAN switches and routers. Why not buy this HDMI Over IP Extender System today? HDTV Supply includes a 1 Year Limited Warranty on this HDMI Over IP Extender system. The warranty states that (a) its products will perform substantially in accordance with the accompanying written materials for a period of 1 year from the date of receipt and (b) that the HDMI Over IP Extender will be free from defects in materials & workmanship under normal use & service for a period of 1 year. In order to get a warranty replacement for a defective item, HDTV Supplys Support Team will verify the product is eligible for warranty. An RMA number will then be issued. Shipped replacements will be in like new conditions, tested and all components included. A 30-day RETURN also comes with this warranty. HDTV Supply also sells a 3 and 5 Year Extended Warranty for this HDMI Over IP Extender. Please go to Extended Warranties or see the above Options to purchase it.